Anchored in contemporary debates on capitalism and political economy, this study reconsiders the major trends which are currently shaping a new stage of capitalism. 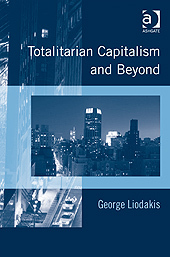 With chapters examining globalization, the role of technology and environmental degradation, George Liodakis constructs a politico-economic approach on contemporary capitalism from within a classical Marxist framework of political economy. The volume provides a fitting balance between theory and empirical evidence and significantly enriches the existing scholarship on contemporary capitalism and the potential for social change. This is an important contribution to those interested in international political economy, in particular with developing a new political strategy for going beyond capitalism: a ‘reinvention’ of a communist perspective. Professor George Liodakis, Technical University of Crete, Greece. No Replies to "Totalitarian Capitalism and Beyond"